The reviews for Tron Legacy were pretty mixed, so I wasn’t sure if I wanted to see it in the theater or not. After reading this review at my beloved IO9, I almost didn’t see it at all. Yet there were reviews like this one, too. (The title didn’t piss me off at all, BTW.) Metacritic and Rotten Tomatoes both gave Tron Legacy slightly less than 50% approval ratings. So I was all, like, “I dunno, man. Maybe I’ll just wait for the DVD.” But I had been off from work for a few days and being indoors makes my migraines go all nasty on me. Not the good kind of nasty, either. So when my wife expressed an interest to see Tron Legacy, I knew it was time to get in the car and drive. So, of all the reviews for the movie, who was right? 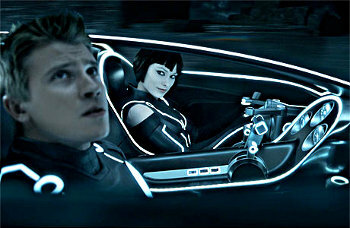 Did Tron Legacy shame it’s predecessor or not? All in all, I liked the movie. It wasn’t totally awesome or anything like that, but I wasn’t disappointed. My wife thought it was merely okay. Here comes the details. Gird your loins for the spoilers, because a few are on the way. I will admit that there were plenty of flaws in the movie. A big one is that Tron (the program from the first film) didn’t get the screen presence he deserved. This isn’t just a problem because his name is in the title. Truth is, I think his story was far more interesting than Sam Flynn’s. Back in the 80s, Kevin Flynn, CLU (who is not the same CLU from the original movie), and Tron had joined forces to create a perfect world inside a computer system. But CLU ambushed Kevin Flynn as part of a coup. Tron, the user champion, went down fighting so Kevin could escape. Only CLU didn’t have Tron “derezzed.” He reprogrammed him into Rinzler, forcing Tron to became CLU’s right hand man and betray everything he once stood for. Tron, the program, could have been the movie’s Darth Vader from Return of the Jedi, a man torn between destinies and obligations. We could have had Yori, Tron’s babe from the first movie, pining over the loss of the man she once loved or searching for a way to bring him back. Those two ideas would have made it a much better movie, I think. Yet we never even see Tron’s face except in flashbacks. Half the time, we aren’t even sure if we’re seeing him or another program on screen because CLU’s thugs all look alike. 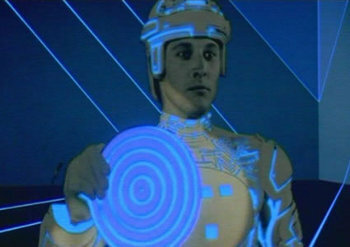 We only know it’s Tron when we see him pull out two light disks instead of just one. To the creators of Tron Legacy, I have to say: huge opportunity wasted there, guys. The father-son angle could also have been given more weight, or Kevin’s sense of failure at losing his perfect society to CLU. These themes were present, but they didn’t resonate. The movie didn’t bother to explain how ISO programs could bring about Flynn’s utopia, either, so that felt more like an afterthought than anything else. In the negative IO9 review mentioned earlier, the reviewer thought Castor’s antics in the End of Line Club stood out in a good way. I thought they were stupid and knocked me out of the film entirely. For my ex-Witness readers, I suggest you consider one theme they did touch upon: the notion of perfection. You can have perfection, as in the new system of things, if you’re willing to sacrifice individuality and freedom. You simply can’t have perfection and free will all at the same time. Ultimately, freedom is chaos, while perfection is totalitarian sameness. The best you can hope for is a decent balance of the two. Which is what we’re trying to achieve in the real world today. At any rate, if you only like movies that are deep and thought provoking, Tron Legacy isn’t for you. It’s a lot like the first Tron-a straightforward movie with cool effects and disk battles. It could have been better, but it wasn’t bad. If nothing else, the techno soundtrack by Daft Punk was surprisingly good. It’s reviews have been consistently higher than the film’s! If you’re a soundtrack junkie like I am, check it out. 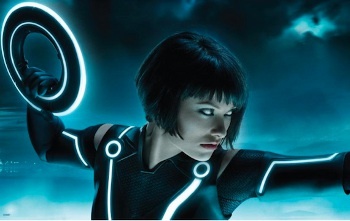 Here are two other articles about Tron Legacy worth checking out. Wow. My pants feel tighter for some reason. Tagged Geeks, movie, movies, nostalgia, review, science fiction, scifi, tron, Tron: Legacy. Bookmark the permalink.